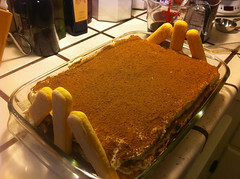 My favorite dessert is this decadent Italian treat, tiramisu. I could eat a whole pan of it. I first made it in grad school when I found out that Kroger was selling Alessi savoiardi (ladyfingers) with a tasty recipe on the back. This recipe is pretty much the same except for a few minor changes. (Time: 0:00) First, you have to make the zabaglione cream. In the top part of a double boiler (or bowl that fits over a medium saucepan), beat together 0.25 C sugar and the egg yolks until pale yellow and fluffy. Meanwhile, put some water in the bottom part of a double-boiler (or medium saucepan) and bring to a boil, then reduce heat to simmer. 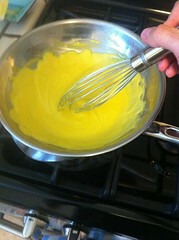 (Time: 0:10) Place egg yolk mixture over water and gradually add 0.5 C rum, beating continuously. Scrape the sides and bottom of the pan regularly. Continue to beat and cook after all rum is added for about 7 minutes until soft mounds can be formed. (Time: 0:17) Transfer to bowl, cover and refrigerate for half an hour. 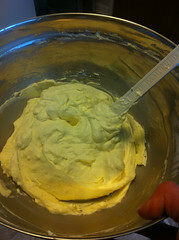 (Time: 0:35) Pour cream into a bowl and whip it with 2 Tbsp sugar until soft peaks form. (Time: 0:47) Fold mascarpone cheese (softened by stirring hard with a spoon) and zabaglione into the whipped cream until smooth. Yeah, it's lumpy. It will get smooth, keep working at it. 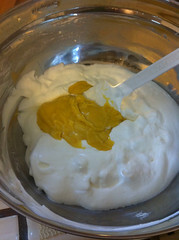 (Time: 1:15) You should now have a nice creamy mixture that's well blended and barely has any lumps yet. Your arm should be sore from the slow folding too. Good job! Refrigerate it for an hour. (Time: 2:00) Make your 8-10 shots of espresso. Mix in 0.5 C spiced rum or marsala and vanilla. (Time: 2:15) Place 17 savoiardi to cover the bottom of a 9x13" pan. Using a turkey baster or spoon, coat the savoiardi each with about 1 Tbsp of the espresso mixture. Remove cheese mixture from the refrigerator and spread 1/3 of it on top of the cookies. Dust the top with cocoa powder. (Time: 2:25) Do it again. Cookies, espresso, cheese, cocoa. (Time: 2:35) Do it again. Cookies, espresso, cheese, cocoa. 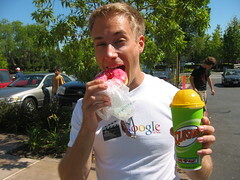 (Time: 2:45) You're done! Refrigerate it overnight.